Fallout 4 is just over a month away from release, but it's entirely possible that you're an impatient person desperate for more Fallout content in that time. If so, I'll assume you already own a copy of Fallout: New Vegas, in which case there's really no good reason not to get the free mod Autumn Leaves when it becomes available tomorrow. Autumn Leaves has been in development for four years, and it shows, with eight quests spanning seven to ten hours, multiple endings, more than 2,000 lines of voiced dialogue, and its own original soundtrack. Think of it as unofficial DLC with a chunk of story related to but separate from the rest of New Vegas. 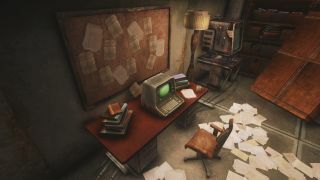 The setting is "a derelict library inhabited by sentient machines, each with their own back-story and agency", and apparently it features "excruciating dilemmas" and "philosophical themes", all of which makes me imagine something like Soma. No word yet on whether we'll get any romance like we nearly had in the base game.